After a pretty disastrous Summer League, I didn’t have high hopes for my bad run ending today unless I did something different and with it being a pairs match I felt the best chance of me and Hurf doing well would be just to get our heads down and fish the short pole. I actually made up a couple of rigs yesterday to fish two and three sections to hand but as I’ve said many times before, it’s not a method I enjoy and I was hoping I’d be able to get some better fish on caster. I got to the Royal Oak in time to have a lovely sausage sarnie and along with the regulars, it was nice to see Tackleuk’s Andy Downton and Glen Radford again. When Rob announced the draw, I suggested Hurf pick two pegs for us as my drawing hand is currently broken! When we looked at the two ping pong balls, it was a case of all the twos as we were on pegs 2 (which is a decent peg) and 22 (not so good). Hurf asked which one I’d rather fish and I said the former as I’d struggled on 22 in one of the Summer League matches. On arriving at my peg, it looked nice with quite a few branches in the water to my right but there were a few sticking out which I just knew would impede flicking the rig out and would cause me problems at some point during the day. 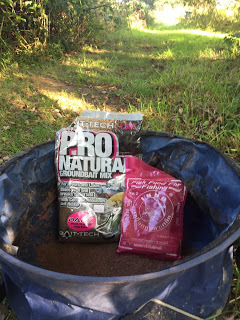 After getting my box level, the first job as always was to mix up some groundbait and today I was using Bait-Tech Pro Nat Dark with a little Eastern Promise added! On my last trip to Thailand I visited a local tackle shop and picked up a couple of bags of groundbait which I think is basically just coloured breadcrumbs but I can’t be sure as I don’t read Thai! I actually set up four rigs today which is practically unheard of for me! 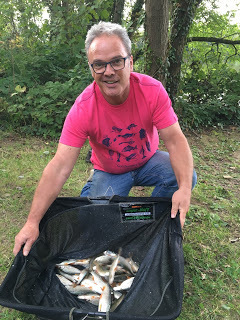 I set up two 0.2 gram Drennan AS1’s to fish at two and three sections to hand, a Preston Chianti to fish up in the water and a 0.5 gram Drennan Roach for fishing on the deck at 8.5 metres. All four rigs had hooklengths comprising size 18 Kamasan B611 barbless hooks and 0.10mm bottoms. I was ready with a few minutes to spare so went to check that Hurf and Steve P still wanted a side bet, they both said yes and Rob wanted to have a pound on it as well. From my peg I couldn’t see any of the other anglers in my section so would have to rely on the bankside banter to get an idea of how I was doing. The only anglers I could see in the other section were John Dursley on 20, Rob on 19, Stuart on 18, Terry on 17 and I could just about see Ash down on the bottom bank. Although I couldn’t see Hurf because of the bush we could hear each other and would be able to keep each other updated throughout the day. 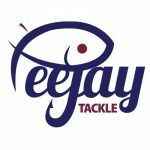 I’d said to him in the pub that I thought we’d need around 12-14lb each to get in the top three and that we should aim for around 300 fish (50 an hour). 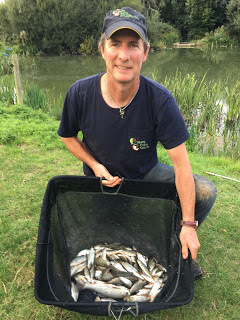 On the whistle I cupped in two balls of groundbait at 8.5 metres before starting at two sections to hand with red maggot on the hook. I fed a pinch of casters and a little nugget of groundbait and was soon swinging in a small roach followed by a tiny perch and another roach, I shouted over to ask Hurf how he was doing and he’d already had 5 fish and was up and running. 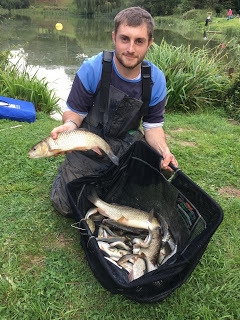 I had planned to switch to caster if I was catching too many small fish but I started catching some lovely roach which required netting and even had a couple of 4oz chublets and a Dillington barbel (gudgeon). After the first hour my clicker was reading 48 and although I was a couple short of my target, I thought I had at least 3lb, probably nearer 4.5lb and if I could maintain this sort of catch rate, 18-20lb was on the cards but I knew there would be some quieter spells. 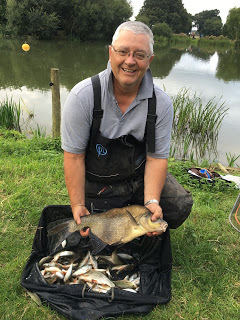 Going into the second hour, I was still catching well when Hurf shouted across that I needed to up my game as Andy Downton in my section had just landed a nice bream. I wasn’t too worried at this early stage as long as he didn’t catch anymore. I added another 49 fish in the second sixty minutes and probably had around 8lb which was still way ahead of my target. 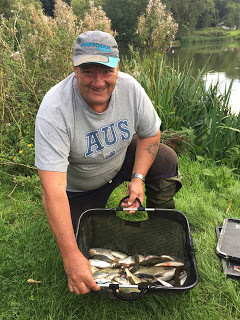 Hurf said he was still catching small fish but had lost count and from what I could see he was doing okay in his section but then John Dursley netted a nice bream on the pole to wipe out Hurf’s early lead and I shouted across that he needed to up his game! My catch rate started to slow as we approached the half way point but I still added another 36 fish to put me over 10lb and it was all going really well. 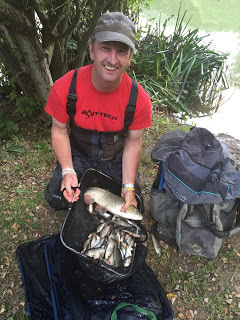 Glen on peg 24 in Hurf’s section had landed a big fish and with Ash on peg 14 catching roach well, it was all very tight. I had no clue how the rest of my section was doing, apart from Andy and his bream. I was still getting some nice roach when disaster struck and the rig went up the tree, I pulled for a break thinking the hooklength would give way but it actually snapped above it and all the shot had pinged off! It took me a while to get the rig sorted again and, as is very often the case, it just wasn’t the same. Then I noticed the line hanging down from the branch and the hook still had a maggot on it and I couldn’t leave it like that in case a bird got hooked up. 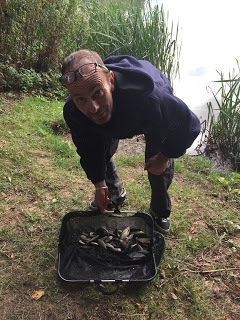 I went up to Scotty and asked if I could nick a cigarette, I asked how he was doing and was a bit taken aback when he said he had over 250 fish but was being battered by Andy who, along with the slab, had a decent skimmer and a pound plus roach! I waited while he sparked up a fag and smoked a bit of it, during which time he had several roach, before I went back and wedged the lit fag in the end of my pole and faffed about before finally burning through the line, this all took time and obviously my catch rate suffered. During the fourth hour I only added another 26 fish and bites had really slowed up so I picked up the three sections to hand rig as I’d noticed Scotty was catching further out. I started getting roach and even added a couple more chublets but the rig wasn’t really heavy enough and it just wasn’t right. 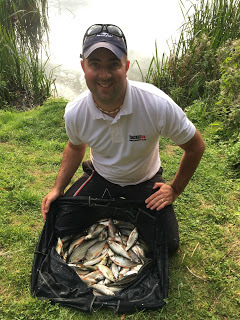 Then news filtered down that Andy had added another bream so it was looking like it would be between him and Glen and Scott and Ash for the top two places and the best we could hope for was third and I still didn’t know how the rest of my section was getting on! I briefly tried the deep rig at 8.5 metres but had to wait for bites and the fish were too small, I had another go at two sections but it just wasn’t happening now and I made the decision to stick with three sections to hand for the remainder of the match. With the final hour well underway, I was still catching some nice roach and the odd chublet although I was missing quite a few bites. Hurf shouted over that Glen had landed several chub and lost a couple so he was looking good to win that section although Ash had been catching roach well on his favoured shallow approach. 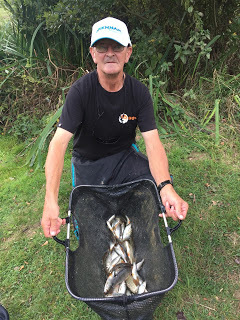 Apart from those two on that side, it looked like it was going to be tight for third place in the section, John had that decent bream, Rob had a couple of decent skimmers and Hurf was still catching small fish. With five minutes to go, my float buried and the strike resulted in a good fish tearing off, it headed straight for the bush on my right so I plunged the pole tip under the water and gave it as much welly as I dared. I started to win the battle and a decent chub came to the top on the inside and I managed to scoop a 3lb chub – bonus. I still had time to add another roach before the finish and ended up with 215 fish and I really had no idea of what sort of weight I had, possibly 15lb or so. I packed up and took some of my kit back to the car and when I got back, Steve P was waiting to weigh me in, I pulled my net out and was happy when the needle settled on 17lb 11oz which is my best weight on the pond for ages. 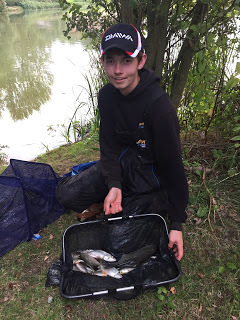 I asked Scotty how many fish he’d had and when he replied he had over 450, I said he must have 20lb, he protested saying he hadn’t had any quality and he was right as he only weighed 19lb 15oz! 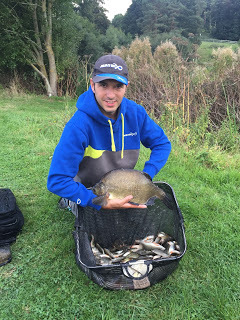 Then Andy plonked his fish on the scales and they bottomed out so we had to take one of his big bream out and after two weighs his total was 22lb 7oz and I was down to third in my section and we’d only weighed three anglers! 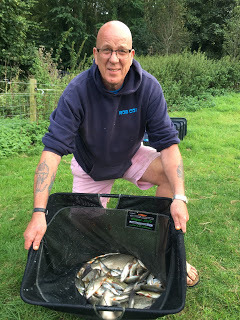 Next up was Steve ‘Nob Budd’ Parker and he weighed 7lb 12oz followed by Paul Homewood who had 10lb 4oz which included a couple of nice skimmers on the long pole from peg 9, Karl also had a nice skimmer and weighed 3lb 15oz from peg 11 and Nick had 6lb 13oz from peg 13. So I finished up third in my section and just then the scales in the other section arrived to weigh Ash so we went to have a look. 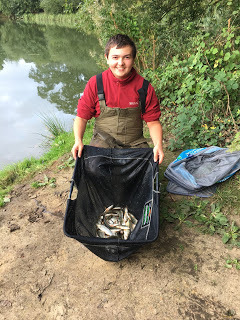 He had a lovely net of roach weighing 19lb 15oz which put him second in the section behind Glen who’d had five chub and some roach for 22lb 3oz from peg 24 and he lost three as well. So back at the results and Andy and Glen were confirmed as the winners with a perfect two point score pushing Scott and Ash down into second place with four points. Then we were read out in third place with seven points, beating John and Paul on weight, and we picked up £20 each plus I had the £3 in side bets. So my bad run has finally ended and it was just nice to catch some fish although at once stage I thought it had all gone wrong when I had my mid match wobble. I’m still off the pace but I don’t feel quite as bad about things. 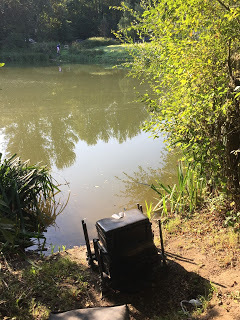 So the pond continues to fish extremely well and it really is an intriguing venue that’s changing all the time, it will be interesting to see how it fishes after the first couple of frosts, will those bonus fish still continue to show? 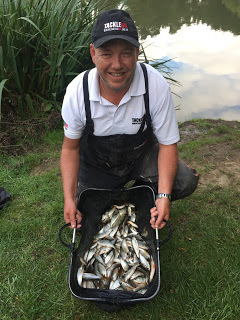 I’m at Summerhayes next week and then the river matches start in October and I’m looking forward to getting back on the Isle although at the moment it needs some rain and a good flush through. It’s no good Jamie your going to have to go to dark side and buy an elasticated whip ! Lovin the blog mate so keep up the good work . 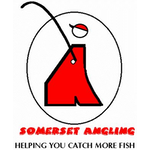 Thanks Derek, glad you’re enjoying the blog and I really appreciate your kind comments, do you do any fishing now? Hopefully yes , would be good to have a catch up and I definitely fancy a day on the isle soon . I may well have a dabble at some point , need some more practice first though as things have changed alot ! Sorry mate, can’t help you there!